Located on E. Sunset Rd. between S. Eastern Ave. and S. Pecos Rd., Extra Space Storage serves Las Vegas residents near Paradise, Whitney Ranch, and Green Valley South. Locals will recognize our facility directly north of Sunset Park and a few minutes east of McDonald's and Taco Bell. We're also accessible for residents of nearby apartments, such as Sunset Pointe Apartments, Mirasol Apartments, Rancho Ocaso Apartments, Mesa Verde, The Commons Apartments, Martinique Bay, and Arabella Apartments. 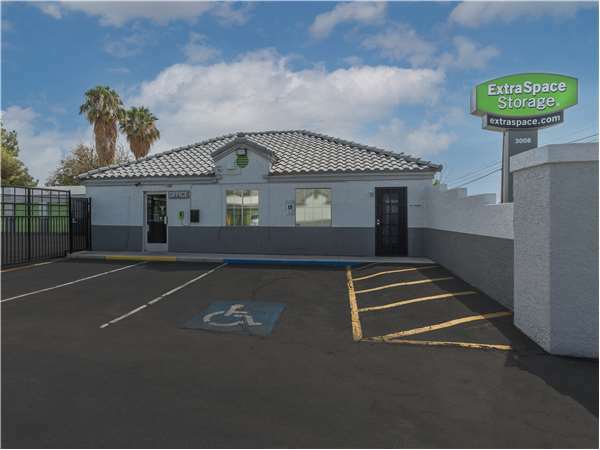 Extra Space Storage is about 2.2 miles from McCarran International Airport, providing an accessible storage solution for Paradise residents who need storage units close to the airport. Are you a college student in Las Vegas who needs summer storage or storage while studying abroad? Extra Space Storage is 3.8 miles from University of Nevada Las Vegas, so we're a convenient option! Customer Service? Is out of this world I’ve never Seen A Whole Team Working Together As They Do & That Manager of yours ? Is literally out standing She’s beautiful inside And Out She’s Almost Like A second Mom ?? ExtraSpace Storage on Sunset has met all of my storage needs. The staff (Holly & Rosa) are very friendly and helpful. The facilities are kept clean and are air conditioned, which is nice in the Las Vegas summer heat. Also, the location is easy to get in and out of. The storage space rental costs are very reasonable compared to other storage facilities. We found a great deal online for a 8x10 unit. I would recommend ExtraSpace Storage to anyone who is in the market for a monthly rental unit. Great customer service received by the lady at the front desk at the E. Sunset Ave. Las Vegas, NV Location! She's awesome and understood my needs immediately. We have had a great previous experience with Trissa & Alisha was awesome in showing the unit & answering questions. We feel this unit is clean, safe & friendly. When I was looking for a storage unit, I needed one fast like in an hour or less, I was leaving for the airport. I was all hooked up with them over the phone and I had items delivered there within an hour. They saved me. It is clean and air conditioned. I love Mike, he is so helpful. I love that My packages can be received and placed in my unit. I like that they have carts parked at each opening, to be able to haul your items from your car to the unit. If you break down your boxes, they make it easy to put in their dumpster. It is a great for me since I fly in out of town once a month to work. I have used many company's over the past 18 years and these guys are the best. I wish I had one in North Salt Lake. I wasn't sure about needing storage. I never used storage before. But the customer service at this location is what made my decision. The security features are a bonus. I will tell everyone I know about Extra Space Storage! Drive south on Pecos Rd. Pass The Home Depot and continue straight on S Pecos Rd. Turn right onto E Sunset Rd. Our facility is on your right, just beyond Sunset Corporate Dr.
Drive north on Pecos Rd. Turn left onto E Sunset Dr. Our facility is on your right, just beyond Sunset Corporate Dr.
Drive west on E Sunset Rd. Pass Green Valley Town Center and continue straight on E Sunset Rd. Our facility is on your right, before McLeod Dr.
Drive east on E Sunset Rd. Pass McCarran International Airport and continue west on E Sunset Rd. At Sunset Ranch Rd, make a U-Turn back onto E Sunset Rd heading west. Our facility is immediately on your right.